How Are Kentucky Bankruptcy Trustees Paid, and How Does That Affect My Bankruptcy? Bankruptcy Trustees come in several flavors. The Covington Division of Kentucky’s federal bankruptcy courts alone have three Chapter 7 bankruptcy trustees, one Chapter 13 bankruptcy trustee, a United States Trustee, and occasional special trustees that might be appointed to oversee especially complex cases or cases in which other trustees might have a conflict of interest. Covington’s bankruptcy court covers all of Northern Kentucky*, but does not cover Cincinnati, Ohio, or the counties around Lexington or Louisville. There are a lot of bankruptcy trustees out there! For this article’s purposes, we are concerned only with the Chapter 7 and Chapter 13 bankruptcy trustees in the Covington Division. Knowing how these trustees are paid, and how they are incentivized, can greatly affect whether you decide to file a Chapter 7 or a Chapter 13 bankruptcy. When a Chapter 7 filed, the Covington Division charges a $335.00 fee as of January 2018. All Northern Kentucky based Chapter 7 Trustees make a flat fee of $75.00 from that filing fee. Chapter 7 bankruptcies are divided into two kinds of cases: “no asset” bankruptcies, and “asset” bankruptcies. In a no asset Chapter 7 bankruptcy, the debtor’s personal property is protected by property exemptions that protect those assets from seizure by the Trustee. This means the debtor’s property is safe, and the Trustee is stuck with only a $75.00 fee for all his or her work. The Trustee is then paid “reasonable compensation” not to exceed 3% on any amount in excess of $1,000,000. Let’s assume the debtor in a Chapter 7 bankruptcy has two cars, but can only protect one using the property exemptions. The Trustee will take possession of the other car, and sell it. If the car sells for $20,000.00, the Trustee will get paid 25% of the first $5,000.00 (which is $1,250.00), and then 10% of the next $15,000.00 (which is $1,500.00). That adds up to $2,750.00 of fee for the Trustee, and the remainder of the car’s sale price goes to the bankruptcy’s unsecured creditors. Notice that the fee schedule for Chapter 7 Trustees has no maximum on the amount that a Trustee can earn. Therefore, anyone with a large, seize-able asset might wind up paying a Chapter 7 Trustee very richly indeed. The types of things that can be considered a seize-able asset might surprise you. We’ve written before about how a personal injury lawsuit can be considered a bankruptcy’s asset, and how a large verdict or settlement designed to compensate a badly injured person can wind up being partially drained by the Trustee’s fee. Chapter 7 Trustees used to be held to a “reasonableness standard” – i.e. any fee they take had to be reasonable, even if the fee schedule mathematically produced a higher result. However, at least Covington based Chapter 7 Trustee has argued that he should no longer be required to take only reasonable fees. If that view holds out, a Trustee’s fees could run into the tens or hundreds of thousands of dollars. For most people reading this article, a Chapter 7 bankruptcy will cost $335.00 in fees, and that is it. The Trustee will be paid out of that. But make sure – absolutely sure – that your attorney has confirmed no assets can be seized, or you could wind up paying the Trustee a lot of extra money out of your own pocket. Chapter 13 Trustees are also paid according to federal law, and unlike Chapter 7 Trustees, their fees are far more consistent. Every Chapter 13 bankruptcy is an “asset” bankruptcy, because the main reasons people file Chapter 13 bankruptcies is to stop foreclosures, stop repossessions, or because they have high income. Therefore, you don’t see the wide variation in fees earned that you see for Chapter 7 Trustees. A Chapter 13 Trustee’s fee is a percentage on all payments made into the Chapter 13 plan, and that percentage is set by the U.S. Attorney General’s office. The Trustee cannot deviate from that percentage, and is therefore incentivized to make sure the payments into the plan are the maximum allowed by law. Conversely, a good Chapter 13 bankruptcy attorney will attempt to make a Chapter 13 plan payment the minimum required by law. The Chapter 13 Trustee for the Covington division of Kentucky’s bankruptcy courts is the Chapter 13 Trustee for the entire eastern half of the state. As of January 2018, that Trustee is will only approve Chapter 13 plans if the plan payments calculate an 8% payment to the Trustee on all payments into the plan. While we cannot say for certain that the Trustee actually takes the 8% fee, that is the best guideline we have as to the percentage taken by the Trustee. Therefore, if a Chapter 13 Plan requires 36 months of payments in the amount of $400.00 each month, that is a total of $14,400.00 in payments over three years. Of that $14,400.00, we can expect the Chapter 13 Trustee to take a fee of about $1,152.00, with the remainder going to various creditors. Again, the amount of the monthly plan payment is subject to a lot of factors, and a good attorney often finds it necessary to look at everything from your mortgages to your credit card statements to find the exact amount. But once that amount is set, so too is the Chapter 13 Trustee’s fee. If you have any other questions about this topic, please call our Fort Mitchell, Kentucky office at 859-371-5997. We are one of the largest bankruptcy filers in Northern Kentucky and we have helped over 3,000 clients. We’re Working Hard for the Working Class, and we want to help you! Can One Protect Their Tax Refund During Bankruptcy? Taxation is something few think about during most of the year, absent the occasional article in the paper or segment on the news concerning the potential for tax reform. However, during the latter portion of the year, particularly between the New Year Holiday and April 15, otherwise known as “Tax Day,” taxes are a topic that come to the forefront of most working Americans’ minds. Although most do not look forward to the prospect of “filing taxes,” many can expect a refund for the amount they have overpaid through the year. For those in the midst of bankruptcy, or considering filing for bankruptcy, a natural concern that arises is what may happen to their tax refund. Although everyone’s circumstances vary, and those that find themselves in this position should seek out legal counsel, this blog post aims to provide a general answer to that question. Can One’s Tax Refund Be Protected During Bankruptcy, Or Is It Subject To Seizure? The best way by which to illustrate the above is by way of example. Hypothetically, if a “debtor” were to file Chapter 7 bankruptcy in January of 2017, and were to subsequently receive a refund for the 2016 tax year, then that money will become part of the bankruptcy estate. Many may find this result somewhat confusing, since the tax refund is received after filing for bankruptcy. The underlying reasoning is grounded upon the period of time in which the money was earned and paid to the IRS; since the money was earned, and taxes on that income were to paid to the IRS, prior to bankruptcy, then the money one receives in the form of a tax refund as the result of any overpayment in taxes is viewed as though it was received throughout the previous tax year, as opposed to after filing for bankruptcy. As one source puts it, the way in which the law views this scenario is somewhat analogous to a savings account – the money overpaid in taxes for the 2016 tax year is “saved” by the IRS, just as one would place funds in savings, and the subsequent tax refund is similar to a “withdrawal.” Thus, under this hypothetical situation, although the debtor does not, in reality, receive the funds until after filing for bankruptcy, the money was earned and taxes paid prior to the filing, and will therefore likely be swept into the bankruptcy estate. Here, the tax refund will be divided into two separate and distinct groups, the first being that portion of the refund attributable to income earned prior to filing for bankruptcy, and the second being that portion attributable to money made after the filing. The first group (that portion of the tax refund that is based on income earned before filing) is subject to being swept into the bankruptcy estate, while the second group (that portion of the tax refund that is based on income earned subsequent to filing) will likely escape the clutches of the estate. In other words, the amount of the tax refund that is calculated based on income earned prior to June of 2017 will become part of the estate, while the amount attributable to income earned subsequent to June of 2017 may be protected. Another example provides some clarity with respect to a third, commonly seen situation. Assume debtor files for bankruptcy in December of 2016, and later receives a tax refund for the 2017 tax year. The concern that immediately comes to mind is whether the 2017 tax refund will be protected, or whether it will be subject to seizure. Here, the debtor will most likely get to retain the full amount of the tax refund, because all the income upon which the taxes were assessed was earned subsequent to filing for bankruptcy. In other words, the entire amount of taxes overpaid for the 2017 tax year were paid after filing for bankruptcy, and would thus generally escape being swept into the bankruptcy estate. A final wrinkle that may be a concern for some is what happens to their tax refund in the context of a Chapter 13, as opposed to a Chapter 7, bankruptcy. The answer is largely grounded in the legal ramifications associated with filing for one type of bankruptcy over the other. When a debtor files bankruptcy under Chapter 7, the bankruptcy trustee takes possession of all of the debtor’s non-exempt property and/or assets, liquidates them (hence the term often used to refer to Chapter 7 bankruptcies, “Chapter 7 Liquidation”), and distributes the cash to the debtor’s creditors. Generally speaking, after the liquidation and subsequent distribution occurs, the debtor is “discharged” of all debts incurred prior to the bankruptcy filing. Under Chapter 13, on the other hand, a debtor repays their debts through utilization of their income, and may retain some of their assets. The period of time in which a debtor makes payments toward their debts is often referred to as a “repayment plan,” and typically lasts three to five years. Once the repayment plan is completed, the debtor’s debts are “discharged.” However, the critical difference between Chapter 7 and Chapter 13 bankruptcies in the context of retention of one’s tax refunds is centered around what is called “disposable income.” To put it in very general, broad terms, under a Chapter 13 plan, one’s “necessary and reasonable” expenses (i.e., generally, those expenses required to live, including, but not necessarily limited to, food, clothing, shelter, etc.) are subtracted from their regular income, and the resulting figure is known as the debtor’s “disposable income.” Most often, when a debtor files a Chapter 13 bankruptcy, and files a repayment plan with the court, tax refunds are not considered in the debtor’s income, and is thus not utilized in calculating the debtor’s necessary and reasonable expenses and disposable income. Thus, when a Chapter 13 debtor receives a tax refund, the amount received is most often considered “disposable income,” since the repayment plan accounts for the debtor’s regular income, regular expenses, etc., but does not factor in the additional funds a debtor will receive when given a tax refund. To put it more simply, the tax refund is, in a way, considered “extra money,” money that the debtor does not need to pay for their “necessary and reasonable” expenses; therefore, it is considered “disposable income,” and will be used to pay the debtor’s debts during the course of the repayment plan. Generally speaking, unless there is some “necessary and reasonable” expense that has not been taken into account by the repayment plan, then the chances of a debtor retaining their tax refund throughout the repayment plan period in a Chapter 13 bankruptcy is slim. Are There Other Ways One Can Protect Their Tax Refund In The Midst Of Bankruptcy? Can Tax Refunds Be Utilized For The Payment Of Legal Fees Rendered In Filing Bankruptcy? Although options are varied, many facing bankruptcy may think of paying legal fees through utilization of one’s tax refund as a means of protecting their refund during bankruptcy. For those considering such an option, it should be noted that others have pursued the same means of protecting their tax refund in the past. To determine the feasibility of this option, the following case law will be discussed. In In re Hunter, the United States Bankruptcy Court for the District of Kansas was faced with the question of whether the assignment of a debtor’s tax refunds to their attorney as a method by which to pay legal fees would be protected, or swept into the bankruptcy estate. The particular circumstances are as follows: the debtors executed an assignment, operation of which allowed for their attorney to receive the pre-petition portion of their tax refunds as a flat-fee retainer in exchange for legal services rendered in filing for Chapter 7 bankruptcy. The bankruptcy trustees moved the court for an order forcing the pre-petition portion of the debtors’ tax refunds into the bankruptcy estate. In support of their motion, the trustees made three primary arguments. The first argument the trustees set forth was predicated on 11 U.S.C. § 544(a), which, generally, provides for the avoidance of “any transfer of property of the debtor or any obligation incurred” under certain circumstances. Those particular circumstances in this case, and from the point of view of the trustees, was that the debtors could not “assign what [was] an essentially undivided and unliquidated expectant interest based upon a notional ‘accrual’ date.” Secondly, the trustees argued that the “debtors [were] required to marshal away from that part of the refund to which the estate [was] entitled.” Finally, the trustees were of the view that assign that portion of their tax refund attributable to pre-petition earnings “‘burden[ed]’ the creditors by effectively forcing them to pay the debtor’s attorneys’ fees and that this burdensome effect render[ed] the assignments fraudulent transfers done for the purpose of hindering or delaying the debtors’ creditors.” The debtors, on the other hand, made one simple argument: “an assignment of pre-petition tax refunds for payment of a flat fee is no different than a debtor paying an attorney a flat fee in cash; the result in either event is that the payment does not become property of the estate,” they argued. It is important to keep in mind that different courts are held and bound to differing rules of law, depending on the jurisdiction. Although the results reached in In re Hunter may seem encouraging, the results reached there are not necessarily applicable in other jurisdictions. As always, it is important to speak to counsel regarding one’s own personal circumstances before coming to any determinations on how best to proceed. Editor’s note: In the Covington Division of the Eastern District of Kentucky Federal Court, where all Northern Kentucky bankruptcies are heard, the Court and Trustees regularly allow debtors to use their tax refunds to pay for the bankruptcy attorney’s fees. Depending on a variety of factors, some of which have been discussed above, a debtor facing the possibility of filing bankruptcy may have some options when it comes to possible retention of their anticipated tax refunds. However, there are a wide array of considerations that must be kept in mind when discussing bankruptcy. Although this post has focused primarily on what many consider to be the most common types of individual, consumer bankruptcies (that is, Chapter 7 and Chapter 13), one may consider Chapter 11 under certain circumstances, as well. Another consideration that was not addressed here involves whether one even qualifies for Chapter 7, or would be pushed into a Chapter 13. Such a determination is based on many factors, one of which is referred to in the bankruptcy arena as the “Means Test.” These considerations are briefly mentioned here to illustrate that the general overview provided above is by no means exhaustive or authoritative, to simply demonstrate that everyone’s circumstances vary, and, depending upon those circumstances, one option may be more appealing than another. Ultimately, however, certain debtors may feel somewhat more comfortable traversing the obstacles of bankruptcy with the knowledge that they may be able to, in one way or another, protect an anticipated tax refund. If you’re considering using your tax refund to file a bankruptcy, call Lawrence & Associates! We’ve been helping people in Northern Kentucky keep their tax refunds for more than a decade. We’re Working Hard for the Working Class, and we want to help you! Jingle Bells or Jingle Blues? The consumer advocate news outlet NerdWallet estimates that the average American will spend $660 for holiday gift transactions. Two other statistics to note include that the number of Americans in credit card debt after the holiday season has been increasing, from 48% of shoppers in 2015 to 56% of shoppers in 2016, and that 27% of Americans did not have a holiday shopping budget in 2016; of those who did have a budget, 24% exceeded it. These statistics beg the question on what would happen if a shopper stocks up on Christmas presents using his credit card, and then subsequently files for bankruptcy. Will those retail store creditors turn into the Grinch and seek the return of gifts from family and friends, or would something else happen? The answer is in the Bankruptcy Code. But before jumping headlong into the primary source material, secondary sources can provide guidance on this topic. For instance, the Administrative Office of the United States Courts has provided an overview of Bankruptcy Basics to introduce lay people to the topic. The Ohio State Bar Association and the Kentucky Bar Association both have pamphlets on bankruptcy. In addition, third-party sites, such as Findlaw and Nolo, have easy-to-use resources. While the Bankruptcy Code is full of legal terms of art and abstract legal concepts, they can be broken down to individual and applicable ideas. For instance, there are six different forms of bankruptcy, but in most cases only Chapter 7 Liquidation or Chapter 13 Adjustment of Debts of an Individual with Regular Income would apply to individual consumers with credit card debt. In Chapter 7 bankruptcy, which is means-tested to prevent abuse, a trustee liquidates the debtor’s assets for cash to pay creditors, unless the specific piece of property is exempt, to give the debtor a fresh start. In Chapter 13 bankruptcy, a debtor may retain valuable assets, such as his home or vehicle, and structure payments to creditors in accordance with his income. Chapter 7 bankruptcy is typically quicker, taking about four months to obtain discharge, to Chapter 13’s duration of three to five years. All Northern Kentucky bankruptcies are filed in federal court in Covington, Kentucky. The objective of the debtor should be to obtain a discharge, which “releases the debtor from personal liability for certain specified types of debts.” But not all debts are created equal. There is also a material difference between secured debt (“[d]ebt backed by a mortgage, pledge of collateral, or other lien; debt for which the creditor has the right to pursue specific pledged property upon default,”) and unsecured debt (“debt for which a creditor holds no special assurance of payment, such as a mortgage or lien; a debt for which credit was extended based solely upon the creditor’s assessment of the debtor’s future ability to pay”). For more information on this distinction, please refer to 11 U.S.C. § 506. While most credit card debt is unsecured, it is important to note that some credit card companies and department store cards retain a security interest, or purchase money security interest, within their contracting agreement with the consumer, often in the fine print of the bottom of the credit card agreement. This security interest would act like collateral on outstanding transactions, and would give the credit card company or department store the right to repossess the property if it was not paid in full. While most credit card debt is unsecured, larger luxury purchases such as televisions, are likely covered by a security interest, and can be repossessed. So how do these concepts apply to a consumer who builds up debt during the holidays? First, the consumer should look at the distinction between secured and unsecured debt. If the consumer has secured debt, or debt with collateral, then potential creditors could attach the property (like a home, car, or improvements on a vehicle) in the event of default. On the other hand, If the consumer has unsecured debt, which is the category of most consumer credit card purchases, then the creditor cannot attach the assets in event of default; however, the creditor may use a debt collector to compel payment, report the failure to credit agencies–reducing the debtor’s credit score and increasing the cost of future loans, or go to court to garnish the wages of the debtor. In addition, the ultimate disposition of the debtor’s credit card issues would also depend on whether the credit card company or department store retained a security interest in the property; if so, there is the possibility the property could be repossessed. There is a matter of timing for debts to be considered dischargeable. Under 11 U.S.C. § 523(a)(2)(C), “debts owed to a single creditor and aggregating more than $675 for luxury goods or services incurred by an individual debtor on or within 90 days before the order for relief under this title are presumed to be nondischargeable.” In plain English, this means that debts to a single company that add up to more than $675 for goods not necessary for the support of the debtor (for example, food, water, shelter), are presumed to allow the creditor to collect against the debtor. Thus, if you exceed more than $675 in holiday credit card debt on luxuries, and not essentials, it may impact future bankruptcy proceedings. In addition, it is important to note that the bankruptcy court may deny discharge in a case if there are fraudulent conveyances, or an attempt to shift assets from the debtor to third-parties for the purpose of avoiding paying creditors. To learn more about this topic, please see 11 U.S.C. § 727; Fed. R. Bankr. P. 4005. In addition, the trustee of the estate or a creditor may petition the bankruptcy court to revoke a discharge “if the discharge was obtained through fraud by the debtor.” See 11 U.S.C. § 727(d). Ultimately, a decision to file for bankruptcy is serious, as it may place your assets in jeopardy and drastically impact your credit rating. On the other hand, if it is structured correctly, bankruptcy can provide you with relief from creditors, especially after the holidays with consumer credit card debt, while preserving your most precious assets, such as your home or car. It is important to note the distinction between secured debt (secured by collateral) and unsecured debt (that is not secured by collateral) before engaging in holiday transactions, in addition to determining whether your credit card company retains any security interest in your transactions by reading the fine print of the credit card agreement. This information, when coupled with sound budgeting, fiscal discipline, and adequate financial disclosure, can make the difference between jingle bells or jingle blues this holiday season. What Will Happen to My Spouse If I File Bankruptcy? There are a lot of reasons to file a bankruptcy, and there are even more reasons to not want your spouse involved. From our Northern Kentucky office, Lawrence & Associates has filed thousands of bankruptcies and seen hundreds of scenarios where it would benefit the people in debt to have only one spouse file for bankruptcy. While we’ve discussed the effect on a non-filing husband or wife when their spouse needs to file bankruptcy before, there are many angles to this question that appear in multiple blog posts rather than all in the same place. This post will consolidate that information. How Do You Decide Whether Both Husband and Wife Need to File Bankruptcy Together? The most important consideration here is determining which debts are driving you toward bankruptcy, and whose name the debts are in. Debts that were obtained in both spouses’ names will make each spouse jointly and severally liable for payment of that debt. For example, if you are behind on your credit card payments and afraid of getting sued, a Chapter 7 bankruptcy is one way to get out from under that high interest rate debt. But who signed the credit card agreement and whose name is the account in? If only the husband or only the wife signed, then only that spouse will need to file bankruptcy. But if both spouses signed the agreement or have cards in their names, then both spouses MUST file bankruptcy to wipe out the debt. If only one spouse files, then the credit card company can still sue the non-filing spouse. If you don’t know whether you might be liable for your husband or wife’s debt, the answer depends on where you live. We covered Kentucky’s equitable division rules previously in this blog, but only at the state level. At the county level, even in an area as small as Northern Kentucky’s seven counties, there is wide variation depending on the judges involved. Boone and Gallatin Counties have one family law judge; Kenton and Campbell counties each have their own family law judge; Pendleton and Robertson Counties share a family law judge with other counties outside the Northern Kentucky area, and; Grant, Bracken, and Mason Counties don’t have a family law judge at all! This wide variation creates a great deal of variability, but usually both spouses will be liable for debt even if only one spouse took out the debt. However, Lawrence & Associates’ attorneys are skilled at finding exceptions to the general rule, so ask before you assume this will apply to you. One thing to bear in mind is that leaving one spouse’s name off of the bankruptcy will not affect what kind of bankruptcy you can file. High income earners must file a Chapter 13 bankruptcy, because federal law will not allow anyone to file a Chapter 7 if they are making more than median income for their state. However, that median income is the income of the household, not the person filing. So, for example, assume a Northern Kentucky family makes above median income because the wife is a highly paid doctor, while the husband is disabled. Even if only the husband has debt and only the husband needs to file bankruptcy, the husband will be forced into a Chapter 13 bankruptcy because the wife’s income raises the total household income above median. Leaving the doctor off the bankruptcy will protect her credit, but will not change the husband’s bankruptcy from a 13 to a 7. In general, credit is linked to a social security number, and only the bankruptcy filer’s social security number appears on the bankruptcy filing. Each person has a separate credit file for credit reporting purposes. Your debts, if the debts are truly yours alone, are not supposed to show in your spouse’s credit report. Similarly, your bankruptcy should not show in your spouse’s file if you have no joint debts. Will My Spouse Have to Come to Court or Be Involved? Your spouse will certainly know a bankruptcy has been filed – the court and your attorney will mail things to your home – but your spouse should not have to attend any hearings or meetings with an attorney in the vast majority of cases. Will Anyone Notify My Spouse’s Employer? It is illegal for a creditor to notify your employer or your spouse’s employer, or any family members, landlords, etc. in an attempt to collect a debt. Further, the bankruptcy court only sends notices to people listed on the bankruptcy, including the debtors, the creditors, and any co-signers. As long as your husband’s or wife’s employer doesn’t fall into those categories, there is no reason the employer should find out about the bankruptcy. One exception to this rule would occur if you choose to have your Chapter 13 bankruptcy payment (which goes to the Chapter 13 Trustee) pulled directly from your spouse’s paycheck. A paycheck garnishment is the most common way to make this payment, and the filing spouse sometimes between jobs, or has some other circumstance that makes pulling the payment from the non-filing husband or wife’s paycheck the most attractive option. If you have any other questions about this topic, please call our Fort Mitchell, Kentucky office at 859-371-5997. 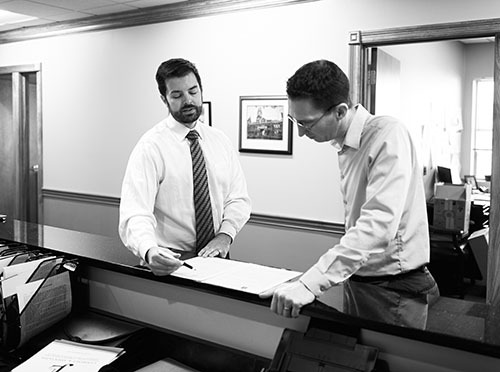 We are one of the largest bankruptcy filers in Northern Kentucky and helped over 3,000 clients. We’re Working Hard for the Working Class, and we want to help you!